You are here: Home / News / Equine Illnesses / Does My Horse Need A Botulism Vaccine If I Feed Round Bales? Does My Horse Need A Botulism Vaccine If I Feed Round Bales? The convenience of round-baled hay has prompted many horse owners to use these in pastures, especially in the winter. Owners should be careful to select round bales that have been stored inside, are of good quality grass hay, and are not excessively dusty or moldy. All round bales will have increased dust over well-made square bales. 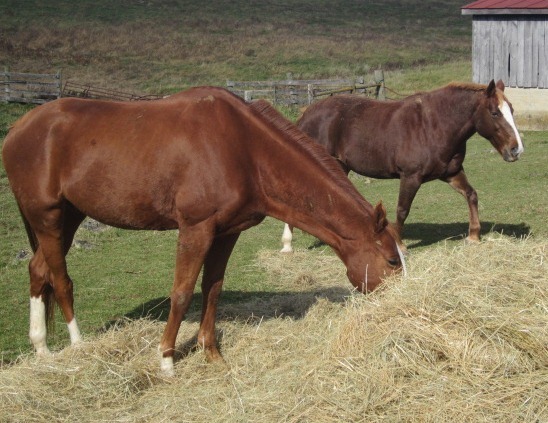 Horses prone to allergic coughs usually have increased problems when eating round bales. Botulism can be a problem in horses that consume round bales. Clostridium botulism is a bacteria that is present in the soil ad in the intestinal tract of wild mammals. Horses become infected with the disease when small mammals are crushed in the baling process. The round bales provide an optimum environment for the development of the Clostridium botulism spores and the production of the botulism toxins. 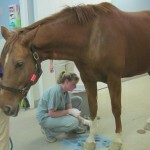 When horses ingest the toxin, it causes weakness, paralysis and can lead to death. We lose several horses each year due to this occurrence and it is easily preventable with the botulism vaccination. At Blue Ridge Equine Clinic, we recommend that all horses consuming round bales receive an initial series of three vaccines and a yearly booster thereafter. https://www.blueridgeequine.com/wp-content/uploads/2013/11/Round-bales1.jpg 423 548 vada http://www.blueridgeequine.com/wp-content/uploads/2012/10/logo.png vada2012-10-29 15:38:102018-07-17 11:41:19Does My Horse Need A Botulism Vaccine If I Feed Round Bales?